This Canadian sticker set was sold in packs which contained one sheet of either three or four stickers. There are a total of 30 different sheets (unnumbered) and 33 different stickers (numbered). Most stickers appear on more than one sheet. 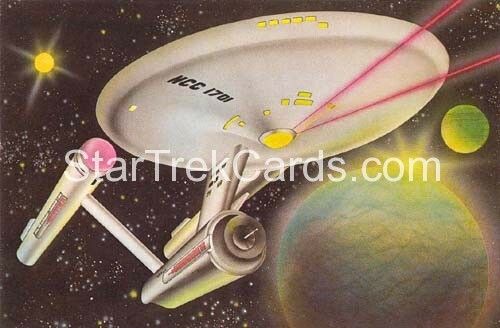 The backs of the stickers sheets combine together to make a large picture of the U.S.S. Enterprise (5 vertical x 6 horizontal). This set also has four different sticker albums. They are all the same except for the poster in the center of the album.